Play Practice Residency organizes the Yoga Practice Teachers Training Program for the 5th time! The program will focus on yoga research and development alongside an intensive physical training offered by experienced teachers from Bangalore. 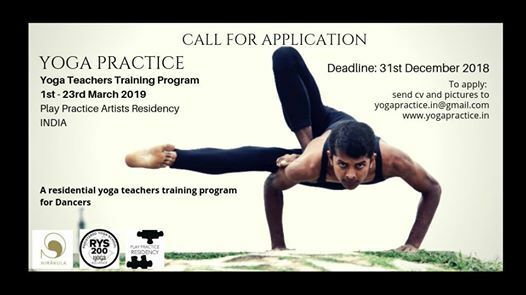 We invite yogis, dancers, choreographers and all physical movement practitioners from martial arts, physical theater, circus and acrobatics to come and experience our month-long intensive training program. 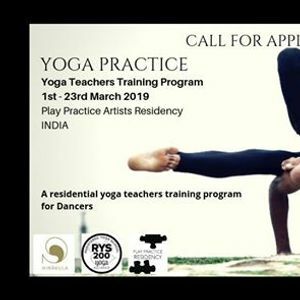 At the end of the course not only you will get a worldwide recognized certification as yoga teacher, but thanks to our immersive program you will also be able to transform the yoga practice into a real source of inspiration for your own movement research.